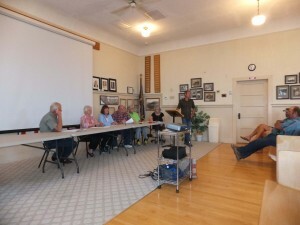 ROCKVILLE – More than 50 Rockville citizens gathered at a recent meeting held at the old Church of Jesus Christ of Latter-Day Saints church that serves as a community center for the town. The meeting was for citizens to hear a report from the Rockville Town Council about the fate of the steel bridge over the Virgin River that has served the community for 89 years. The attendance was about 20 percent of the population, a rate that many communities don’t get in voting. The bridge, built in 1924, provides access to the south side of Rockville, as well as the historic Grafton ghost town, Apple Valley, and communication towers serving the entire area. Unless the bridge is overhauled or replaced, access to these areas could be lost. 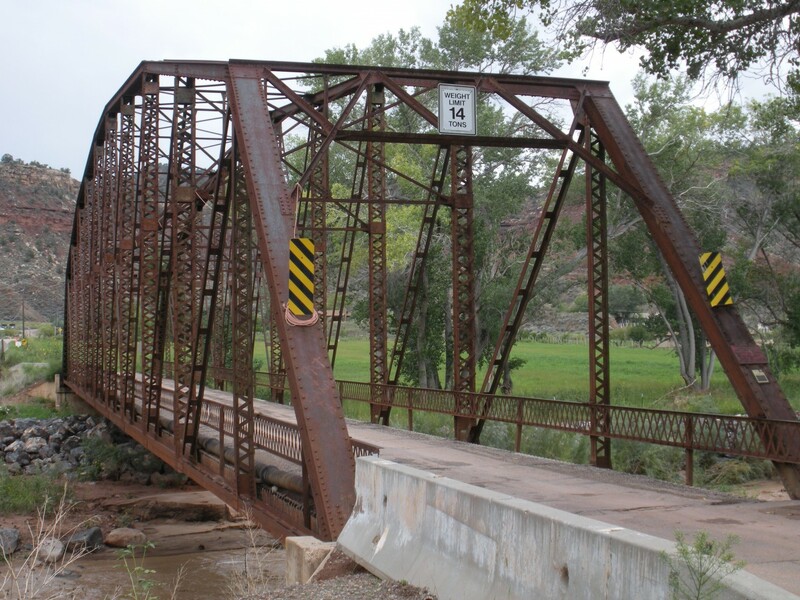 The future of the bridge came into question when the Utah Department of Transportation downgraded the capacity of the bridge to 14 tons. Due to traffic weight constrictions, Mayor Dan McGuire said they had received an estimate that the cost of construction on the south side of the river is 30 percent more than on the north due to the extra cost of crossing the river with smaller loads. Councilwoman Pam Leach said the “sufficiency rating” of the current bridge is only 45.7 on a scale of 100 and is dropping. Leach added the estimated remaining life of the existing bridge is only 10 to 15 years. This doesn’t include the possibility of bridge failure due to something like a flood or an accident. Since it will take five or six years to replace the bridge, Rockville only has half that time to do something. “Something has to be done,” McGuire said. The Council had prepared a comprehensive report about the history of the bridge and the work they had done to find options. McGuire gave credit to the State of Utah and Washington County officials for their cooperation for providing advice and engineering studies that has made it possible to receive a grant of $3.2 million that could replace the existing bridge with an unprecedented low match rate of 6.77 percent that puts a project like this within the reach of Rockville. Replace the bridge with a new one. Perform a major rehabilitation of the existing bridge with Rockville’s share of the project using the low match rate of 6.77 percent ranging from $140,000 to $230,000. Since Rockville’s total annual budget is only about $200,000, this will strain the town’s ability to the maximum. When the meeting was opened to discussion, Rockville citizens were not willing to give up on their bridge. Most wanted a new bridge somewhere other than right next to the old bridge so the old bridge could be preserved the way it is now. Jack Burns said that because the bridge was added to the National Register of Historic Places in 1995, the possibility that it could be torn down is “on the radar” of historical groups. Councilman Bernie Harris noted that although the town has six roads that go down to the river on the north side that might be used for a bridge approach, the land on the south side is private and could be a serious problem in locating a bridge somewhere else. After a career creating software for business, Dan Mabbutt moved to the finest little town in the known universe: Springdale, Utah. Since he has always been a writer trapped in the body of a techie, he now spends most of his day in front of one of his computers doing what he always wanted to do: writing. Dan freelances for a variety of publications that has included Utah Business, Catalyst, and a lot of technical magazines but especially St. George News.